Comes with Music: 3 times the fun! Nokia's worries that its Comes with Music service, set to debut on 15 October, wouldn't be picked up by any network operators seem to have been relieved as 3 has decided it could do with some more tunes. The Carphone Warehouse was the only place for users to get their unlimited music kicks, but now 3 customers will be able to benefit as well. Pocket-lint has revealed that the first device to use the service will be the Nokia N96 8GB handset, according to an anonymous source, and is added to the 5800 and 5310 XpressMusic handsets unveiled as flagship devices at the recent Nokia event. 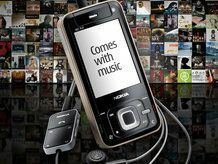 Nokia appeared to be struggling to offer the service to companies with their own music services already in place, but given the fact CwM could help shape the mobile music landscape for years to come, 3 has decided to take a punt. This means other operators are likely to follow suit in the near future, especially if the service performs well at The Carphone Warehouse. An official announcement is expected soon from Nokia and 3, which will be when dates and possibly other handsets are unveiled as well.